A belated shout out to Andrew Partridge, organiser of Scotland Loves Anime, which played at the Edinburgh Filmhouse 14&endash;16 October. With my family I saw Coicent, Towanoquon, Five Numbers, and Oblivion Island: Haruka and the Magic Mirror. 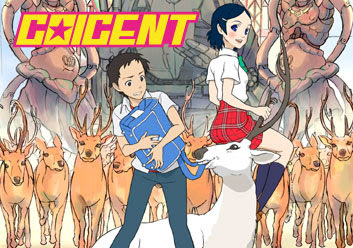 I particularly liked Coicent, illustrated above, because it is set in Nara and I recoginised the deer and the temple that feature in it from my visit there as an invited speaker at RTS, back in April 2005. But the real surprise was when Andrew, introducing Oblivion Island, recognised me sitting in the audience, and reminisced about learning Haskell and monads in first year at university, where he was a student in my first-year class. He's done a great job with Scotland Loves Anime, and it's wonderful to see the wide variety of activities our students initiate.